The government has kept around Rs 5,000 crore as buffer for "any last-minute contingency"
With the latest round, the government has so far pumped Rs 1.89 trillion into PSBs since it announced the recapitalisation plan in October 2017. “We have looked at the entire PSB universe, and this round of recapitalisation takes care of every bank’s needs, besides rewarding better-performing PCA banks and enabling them to stay above all the PCA triggers,” Kumar told Business Standard. The government has kept around Rs 5,000 crore as buffer for “any last-minute contingency”, which might also be used for infusion into the merged entity of Bank of Baroda, Dena Bank and Vijaya Bank, a finance ministry official said. The official, however, added that the new entity might not require a huge amount of capital infusion as it would be above all the regulatory requirements “with strong fundamentals”. Some analysts expressed surprise that the government had not allocated any money towards the three banks, which will operate as one entity from April 1. “We expect a large portion of the infused capital to be utilised for provisioning for non-performing assets and hence growth capital is expected to be limited with banks,” said Anil Gupta, vice-president and sector head, financial sector ratings, ICRA. He added that with the government not announcing any capital infusion for 2019-20 in its interim Budget and limited growth capital available with PSBs, the banks’ ability to support credit growth would remain dependent on their ability to raise fresh capital from the market or the government announcing more capital in the full Budget after the Lok Sabha elections. 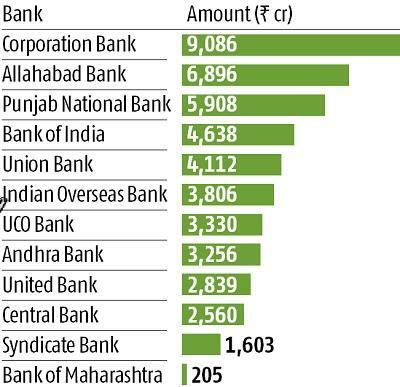 One-third of the recapitalisation sum of Rs 48,239 crore will go into Corporation Bank (Rs 9,086 crore) and Allahabad Bank (Rs 6,896 crore), which the government said were “better-performing PCA banks”. Recently, the RBI had moved Bank of Maharashtra and Bank of India out of the PCA framework while lifting certain restrictions on Oriental Bank of Commerce. 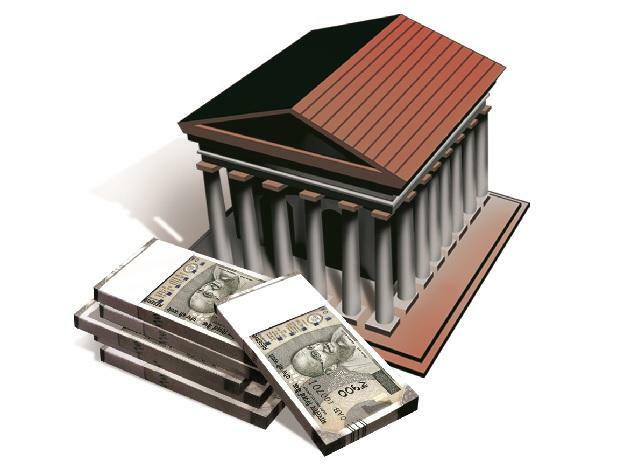 The government has allocated Rs 4,638 crore towards Bank of India and Rs 205 crore towards Bank of Maharashtra. Further, the government has allocated Rs 12,535 crore towards four PCA banks to ensure they meet their minimum capital requirements. These were: Indian Overseas Bank (Rs 3,806 crore), UCO Bank (Rs 3,330 crore), United Bank (Rs 2,839 crore) and Central Bank (Rs 2,560 crore). Banks are hopeful that the capital infusion will expedite the process of moving them out of the PCA framework. Corporation Bank Managing Director and Chief Executive P V Bharathi said the bank had expected to move out of PCA by the end of 2019-20 “on our own with improvement in all parameters” but now, with the capital infusion, this (exit) could happen in early FY20.